Cedar shake roofs use wooden shingles that are made from split logs. The roofs have a distinctive look because the thickness and length of each shingle can vary. This type of roofing has been in existence in North America since the days of the colonists. The average lifespan of a properly cared for cedar shake roof is approximately 7-15 years. This may sound like a lot until you understand that manufacturers, like GAF, offer non-prorated warranties covering both labor and materials, up to 50 years on metal and asphalt roofs. 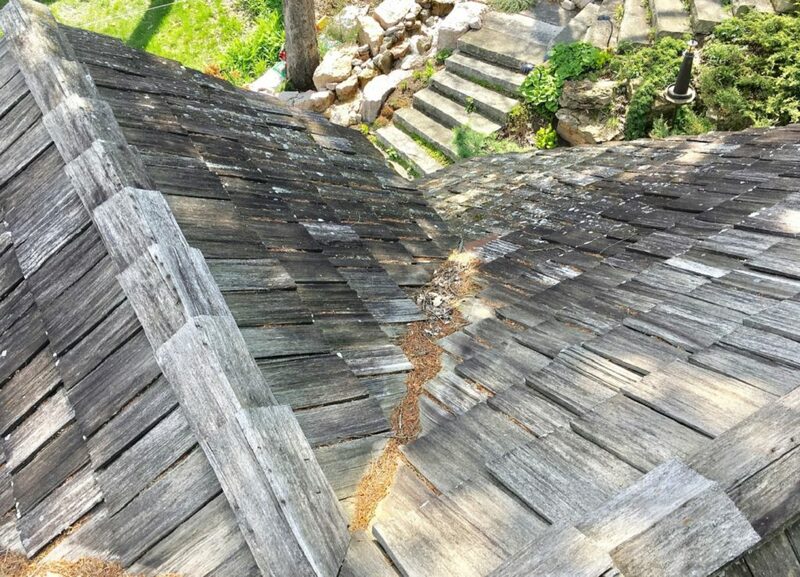 Cedar shakes can be a poor choice in humid climates which can cause the shingles to age prematurely. 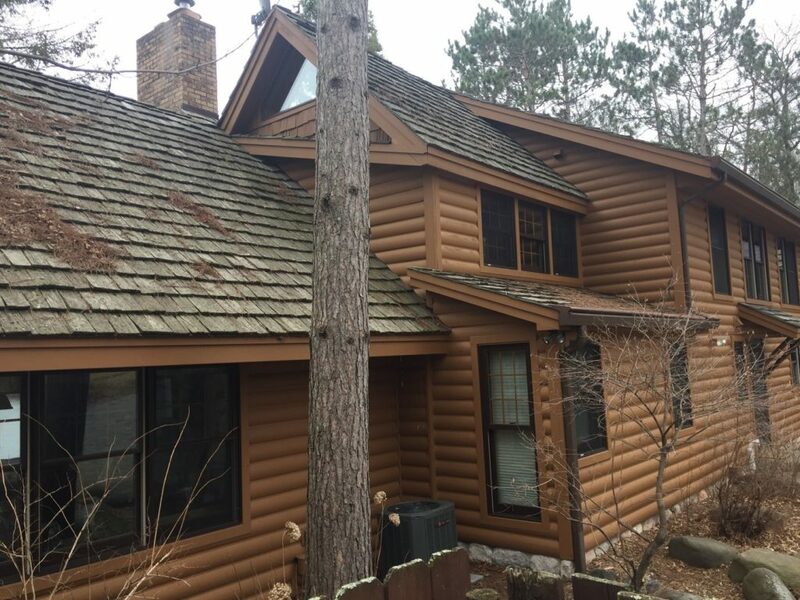 Because cedar shakes are made out of essentially the same material used in a campfire, your insurance company may charge a premium for this type of roofing since it is not fire retardant. (Retardant chemicals are available but most need to be reapplied every time it rains. Cedar shakes need to be cleaned every 4 to 5 years to maintain their appearance. The process often involves pressure washing. Beware that using to high of a setting on the pressure washer which can damage the roof and cause premature aging. Roof should be inspected annually by a professional for signs of aging wear, insect infiltration, rot, etc. Cedar shake roofs are prone to algae & moss growth which can endanger both your family’s health & safety. When it rains, moss traps moisture and prevents the cedar shake roof from ever drying out. As time goes on, this can cause the roof to leak. In the winter, the roof’s moisture freezes and thaws repeatedly which does nothing except cause damage. Trees are a renewable resource. However, cedar does not grow as fast as other types of trees. Experts estimate that the time it takes for a cedar tree to reach the maturity level needed for cedar shake roofing can be anywhere from 200-400 years. As cedar becomes more and more rare, the price of this type of roofing will be driven up due to the rules of supply and demand. "Great to deal with. Came and removed my gutters ahead of time, replaced roof and came back to reinstall gutters." - Jim D.
"I let anyone I talk to with gutter or roofing needs know about Lindus. I have three LeafGuard® installations in my family alone that I have purchased and now the roof on my aunt’s home. Your company has consistently delivered excellent service and quality. Both difficult to find. Your company does stand above the rest. Please don’t ever compromise your standards for I am continually sharing your name and singing your praises to folks who need excellent workmanship and accountability. Thank you for jobs well done!!!!!!!" - Jeanne H.
"Lindus did an excellent job of communicating with us before and during the job. The workers were punctual and professional, worked very hard to finish our job on time. Cleanup was thorough. We're very happy with our new roof, and excited about LeafGuard® gutters because our property has tons of trees. Would use Lindus again and recommend to others." - Robert S.